An optimized rapid 3-dimensional T1-weighted technique. For body imaging and MRA, acquisitions often use half-Fourier (0.5 NEX) technique to minimize acquisition time, SPectral Inversion At Lipids (SPECIAL, or SPIR) fat suppression is more effective and more efficient that the fat saturation method used for other techniques. Zero-Fill Interpolation involves inserting zeros in k-space; at TJUH it is used most commonly to produce overlapping sections, also referred to as overcontiguous. We use 3D spoiled gradient echo for all dynamic contrast enhanced imaging in the body, including MRA, and use it as well for mangafodipir (Teslascan)-enhanced studies. 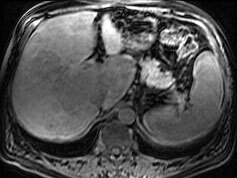 For imaging liver and other tissues, flip angle should be about 15 degrees, to prevent oversaturation of tissues. For MRA, saturation of tissues is desirable to reduce background, so flip angle should be 40 degrees or more. 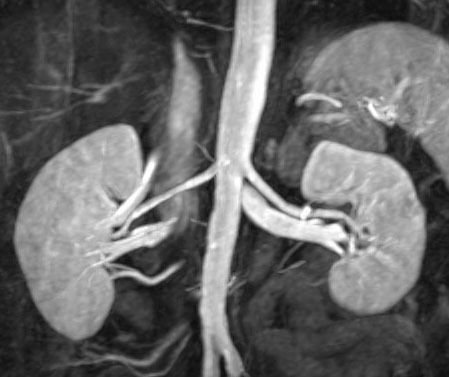 Axial 3D images with SPECIAL fat suppression prior to (top) and during the arterial post-contrast phase (bottom) in a patient with metastases from colonic carcinoma. 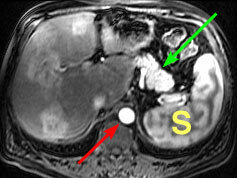 Signs of a successful arterial phase include intense enhancement of aorta (red), pancreas (green) and spleen (S). Coronal Maximium Intensity Projection (MIP) image using 3D spoiled gradient echo techique, with flip angle = 50 degrees, higher than that used at left (15 degrees).